The Duke of Edinburgh was a visible absence from June's busy roster of British royal events - but he wasn't the only one missing. Princess Alexandra of Kent, the Hon. Lady Ogilvy - one of the Queen's cousins, the daughter of the Duke of Kent and Princess Marina of Greece and Denmark and a granddaughter of King George V - has been struggling with her health (she suffers from polymyalgia rheumatica) as well and has cancelled all her engagements for some time now. I thought we'd send her some well wishes today by chatting about her tiara, a diadem which also happens to be a very popular request for the full Thursday treatment from you lot. As a young princess, Alexandra occasionally wore a set of diamond flowers in her hair. Around the time of her engagement to the Hon. Angus Ogilvy, the flowers were turned into a tiara of her very own. The tiara includes a series of those five petal diamond flowers, each one with an interchangeable stone in the center, set in a swirling diamond ribbon structure. She also received earrings and a necklace to complete her parure. The necklace was made as a copy of Queen Victoria's Golden Jubilee Necklace now worn by Queen Elizabeth II, though for obvious reasons the copy leaves out the crown that tops the center of the original necklace. The set includes interchangeable stone options: the center of the flowers in the tiara can be either pearl, sapphire, or turquoise, at the least. 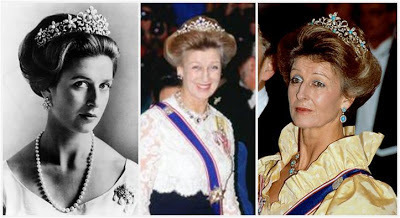 By changing the stones in the flowers, which are scattered throughout the tiara, the tiara manages a pretty complete transformation with a selection of smaller stones; a more complete change than the one accomplished by changing only one stone, such as you see in the different versions of the Gloucester Honeysuckle Tiara or the Modern Gold Tiara. Princess Alexandra attends plenty of tiara events (she has been a key supporter of the Queen at state banquets and other such events for years) but this is the only tiara she owns. 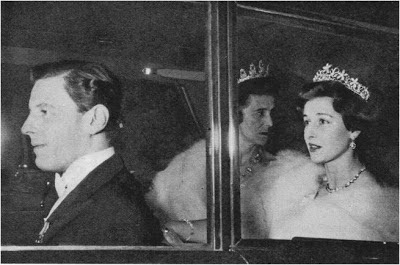 She wore other tiaras belonging to her mother in her youth, but they were all inherited by her brothers, the Duke of Kent and Prince Michael of Kent. 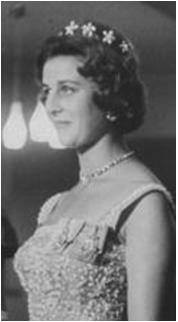 (Common speculation is that Princess Marina adhered to an old tradition: no need to leave your daughters jewels, since their husbands and husbands' families ought to provide in that department.) But if she's only going to have one, I think she got the best possible one: she has the added versatility, plus a tiara exceptionally well suited to her own style. 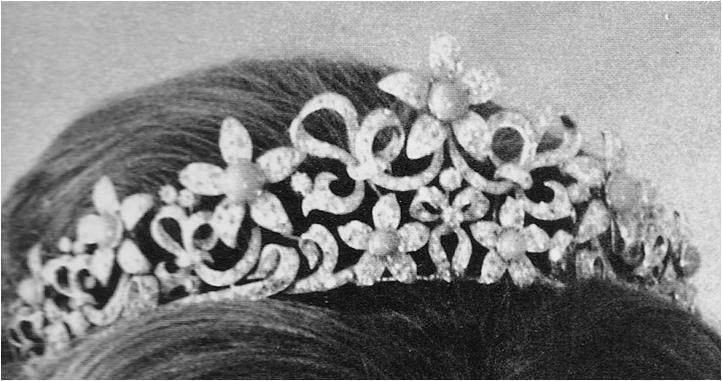 How do you rate this tiara?